In November and December 1967, Dr. Martin Luther King, Jr., delivered five lectures for the renowned Massey Lecture Series of the Canadian Broadcasting Corporation. 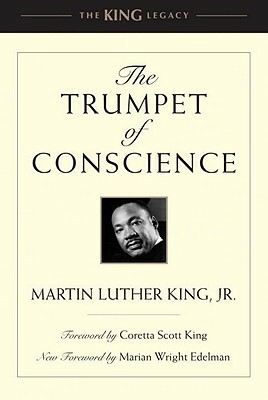 Immediately released under the title Conscience for Change after King’s assassination, it was republished as The Trumpet of Conscience. Each oration speaks prophetically to today’s perils, addressing issues of equality, conscience and war, the mobilization of young people, and nonviolence. The book concludes with “A Christmas Sermon on Peace,” a powerful lecture about nonviolence as a path to world peace that was broadcast live from Ebenezer Baptist Church on Christmas Eve in 1967. Dr. Martin Luther King, Jr. (1929–1968), Nobel Peace Prize laureate and architect of the nonviolent civil rights movement, was among the twentieth century’s most influential figures. One of the greatest orators in U.S. history, King also authored several books, including Stride Toward Freedom: The Montgomery Story, Where Do We Go from Here: Chaos or Community?, and Why We Can’t Wait. His speeches, sermons, and writings are inspirational and timeless. King was assassinated in Memphis, Tennessee, on April 4, 1968. Coretta Scott King (1927–2006), the wife of Martin Luther King, Jr., was an author and a human rights activist. She helped lead the civil rights movement after King’s assassination, carrying the message of nonviolence and the dream of a beloved community to many countries and spearheading civil rights coalitions and foundations.